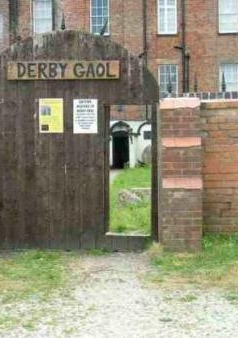 The name Derby Gaol refers to 5 gaols in Derby, 2 of which are open to the public, these being Friar Gate Gaol (built 1756) and Vernon Street Prison (built 1843). The Friar Gate Gaol was the site of many hangings and is now open as a museum, displaying records and accounts of executions as well as a replica of the original gallows. Vernon Street Prison served as the county prison from 1843 to 1919 and the last public execution in the city took place on the grounds in 1862. Friar Gate Gaol is a hot-spot for paranormal activity, with many of the cells (including the condemmed cell) claiming to be the source of intense activity. People often see a grey mist creeping across the room near the main entrance, also the smell of roses has been reported but the source of the smell remains a mystery. The building was visited by Living TV's Most Haunted in 2002 and is now run by Richard Felix who often hosts investigations and ghost walks through the building.